The Certified Registration and Pedigree Certificate issued by the PCCI for each registered dog is considered as the proof of ownership of the dog by the person holding the certificate. Just like ownership titles or birth certificates, this document should be kept in a secure storage area to minimize loss or damage. b. It was lost by the unregistered owner. Case 1. The person who lost the dog's Registration and Pedigree Certificate is listed with the PCCI as the registered owner. 1. Secure a copy of the PCCI Affidavit Form from the PCCI or download it from this website. 2. Fill-up and sign the form and send it to the PCCI office along with your payment for the Duplicate Copy amounting to Php336.00 plus any dues that may not have been paid or updated at the time of the request for the Duplicate Copy. 1. Secure copies of the PCCI Affidavit Form and the Supplemental Transfer Statement Form from the PCCI or by downloading these from this website. 2. 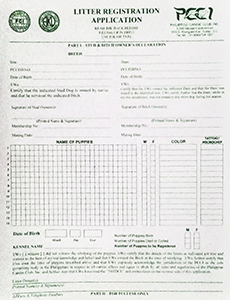 Request the dog's recorded owner (per PCCI records) to fill up the two forms. Php336.00 processing fee (you can either pay by check or money order made payable to the PCCI. 4. Submit the completed documents and the required fees to the PCCI office. Alternatively, these may also be sent through courier or the postal system.